Debt Advice or Higher Councillor Salaries? 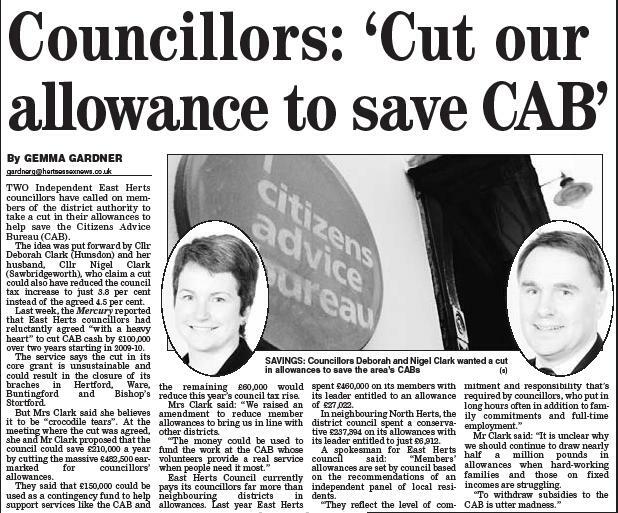 Independent East Herts Councillors Nigel and Deborah Clark have been hard at work fighting for taxpayers. Despite having their alternative budget rejected – a budget that would have lowered councillor allowances and cut the council tax rise in the borough – they are now fighting to save the local Citizens Advice Bureau from closure. Their plan would see councillor allowances – meant to pay for postage and other expenses – reduced to save the East Herts CAB from closure. Councillor Deborah Clark argued that by taking only £210,000 a year from the massive £482,500 reserved for councillor allowances will save the CAB as well as reducing Council Tax. Set in context, East Herts council pays its councillors far more than neighbouring councils and could easily afford cuts to prioritise essential services. Therefore the savings can be made. As you’ll see from the newspaper clipping above, the council fudged the issue, stating that councillor salaries are set by an ‘Independent’ Remuneration Panel that only makes recommendations, recommendations the council votes on, however, and can reject. Therefore they’re trying to pass the buck, like they do when they blame central government for high council tax. This is where you can come in to pressure the council. Tell East Herts council to support Nigel and Deborah Clark in their campaign to seek value for money for taxpayers. Please write to the Hertfordshire Mercury and show your support for lower taxes and those councillors who actually vote to put taxpayers first! If we can get a thriving public debate going, we can show that the people want tax cuts and their money spent on frontline services and not more snouts in the trough.